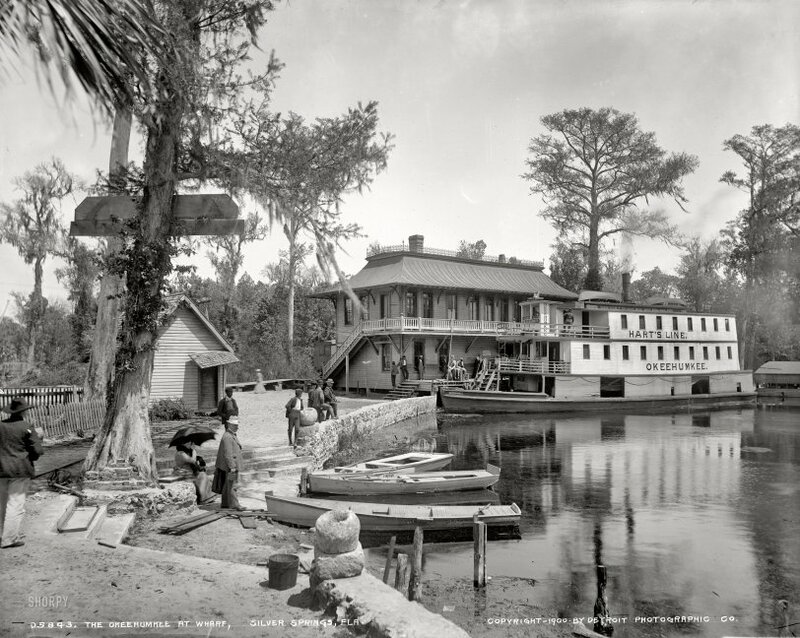 Silver Springs, Florida, circa 1900. 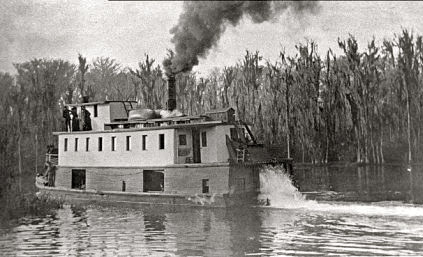 "Okeehumkee at wharf on the Oklawaha River." Detroit Publishing Company glass negative. View full size. Submitted by deejayq on Mon, 07/26/2010 - 9:52pm. Maybe the steps and concrete and brickwork around the shoreline is to aid the Northern tourists who may be unfamiliar with Florida wetlands. The root system of live oaks and other water-loving trees usually have a lot of twisty-turny runners right at the surface level of the surrounding ground. In other words, plenty easy to trip over! -- Another excellent shot, Dave. Thanks! Submitted by michaeljy on Mon, 07/26/2010 - 8:47am. Several writers asked questions or commented about the small building to the left of the depot, and the strange railroad track leading up to its door. (I think that's what Fred was referring to in his question.) If it's not too late, I would like to offer a theory by way of explanation. I believe the track leading up to it was most likely used to park privately owned, leased or chartered Pullman cars, which was a very common mode of travel in those times. 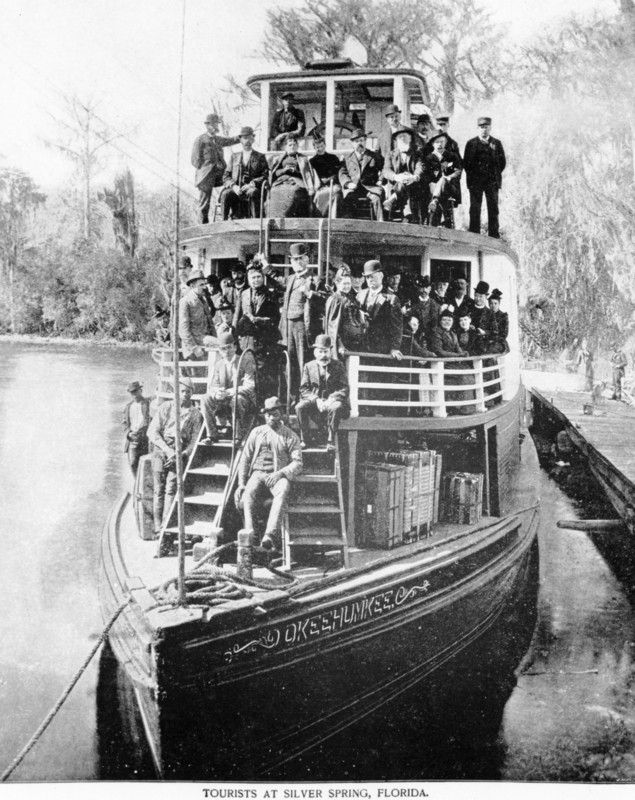 (Note the steps at the foot of the "brick" tree, which would have been in just the right spot to facilitate stepping down from a railway car to a waiting boat. Anyone wealthy enough to have a private railroad car would likely have a private boat, also.) In fact, the whole arrangement, which appears not to have been used in a long while, might have been set up for one special "celebrity" customer, who frequently needed to transfer from train to boat at this point. Perhaps they owned a vacation mansion nearby. These private cars needed special supplies, and tools for their maintenance, etc. 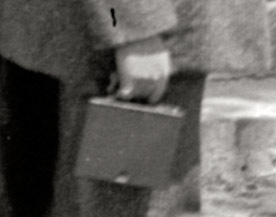 They had to be kept separate from "regular" supplies used in everyday operations, for cost accounting purposes. The building itself might have been owned by the Pullman Company, a separate entity from the railroad. Than again, a far less romantic theory would be that the storehouse was once used by the local "roadmaster" (track maintenance supervisor) for his supplies, and the track was there so he could easily push his small hand cars up to the door for loading. Submitted by Anonymous Tipster on Mon, 12/14/2009 - 6:02pm. I have a book called "Eternal Spring: Man's 10,000 Years of History at Florida's Silver Springs," which has a photo of this same structure. It is identified as a freight depot and was "built around the turn of the century," so it was quite new in this photo. The Book is a second edition from 1969 and the info is on page 140. Find the boxcar - Chapeau! Submitted by Alex on Thu, 09/10/2009 - 8:40am. What a keen observer you are Dave! It even took me minutes after your hint to find it. Submitted by tonycooper on Thu, 09/03/2009 - 10:34pm. A great look at the early history of the area and the many Riverboats that plied the river to Silver Springs. Submitted by Coke on Thu, 09/03/2009 - 5:42pm. Incredible. Looks like a movie set, not like reality. Submitted by willc on Wed, 09/02/2009 - 1:51pm. There's so many fun details in this photo that it took the brick tree comment to get me down into the lower left corner. Someone has thoughtfully provided an iron rail boot scraper on the second step up from the muddy shore, for the convenience of the expensively dressed tourists (and the people who had to clean the floors and rugs in all the buildings around the landing). And what about that rail siding that ends right at the door of the little shed with the Porch Roof of Damocles? It looks like a set-up for a silent movie gag. Submitted by Anonymous Tipster on Wed, 09/02/2009 - 6:30am. It has a paddle at the back. Submitted by Anonymous Tipster on Wed, 09/02/2009 - 3:41am. The okeehumkee does not appear to have side or stern wheels. Is it prop driven? Submitted by Gnostar on Tue, 09/01/2009 - 9:25pm. OK, explain again how these people could survive there 10 months out of the year wearing the clothes they have on in this picture when there was no air conditioning to go home to. I'll grant the clothing was of natural materials, which breathe better, but after that ... Could the photo have been taken in the depths of "winter"? Submitted by jim on Tue, 09/01/2009 - 12:54pm. Looks like the establishing shot in an old movie. Not sure why I like this picture so much. Submitted by Silv Erchloride on Tue, 09/01/2009 - 12:33pm. Another view of the Okeehumkee earning its keep. Submitted by fanhead on Tue, 09/01/2009 - 11:27am. Being a Tampa native I made many visits to Silver Springs and Six-Gun Territory. In its last few years Six-Gun admittedly did start going downhill. However in its prime I remember it as a wonderful family entertainment destination. The "Old West" buildings were well made and historically accurate, and the staged gunfights and saloon shows were done professionally. No,it doesn't compare to Disney (the Holy Grail of tacky tourist rip-off), but at least a family could spend the day there without spending obscene amounts of money. GlenJay, you are right, the Ocala area is not the same now. Neither is Florida. Too bad. Submitted by Anonymous Arkie on Tue, 09/01/2009 - 10:00am. There seems to be a strong "Key Largo" feel to these Florida pictures. Expect Bogart to show up at any time! Submitted by GeezerNYC on Tue, 09/01/2009 - 10:00am. The guy standing next to the lady with the umbrella looks like he might be carrying an early Brownie. Submitted by Anonymous Tipster on Tue, 09/01/2009 - 9:19am. I believe that I have seen this exact location modeled in miniature in the Narrow Gauge Gazette a few years back. Submitted by Fred on Tue, 09/01/2009 - 9:02am. Has anyone any idea of what the railway track (bottom left) was for? Gorgeous picture, what a time to be alive! Submitted by SHORPAHOLIC on Tue, 09/01/2009 - 8:46am. What a great picture. It really makes me wish I could have experienced it firsthand. Lots of interesting details in this one. Keep 'em coming! Submitted by sjmills on Tue, 09/01/2009 - 8:35am. We can see your tax dollars at work—the real tree is being replaced with a more fiscally viable brick tree. Submitted by GlenJay on Tue, 09/01/2009 - 7:46am. I grew up near Silver Springs. (And I now live near Silver Spring!) In the 50s and 60s Silver Springs still had many traces of the rural resort that you see in this photo. The main attraction was the glass bottom boats, which were there in 1900 and are still there today. The awful, ironically named Wild Waters Park had not yet appeared, but there was a tacky tourist rip-off called Six-Gun Territory. I like to think of Silver Springs as the Old Florida that I just barely caught before it disappeared. I'd be afraid to go back there now after 40 more years of Florida "development." Submitted by Peter Hovmand on Tue, 09/01/2009 - 3:27am. This is simply a sublime, magic picture! Thanks.